This section correlates various news feeds from the Twitter service that are related to Doctor Who locations/filming. Please note that this means that there are likely to be spoilers present so only read at your own risk! @Liberalbotanist @omfell @andyjames20052 @EmmaKennedy You don’t vote for candidates, you vote for parties. @KiwiGooner01 @simon_watkins @Two_Penneth @Andrew_Adonis “Labour is a hard Brexit party” outs you as either a moron or a troll. Sorry, but any serious discussion/debate, with respect to facts, becomes utterly pointless in the face of such idiocy and absurdity. Even as a troll you’re crap. Learn to at least pretend you’re serious. @TomSpilsbury @VortiGan_ @paulshields In Wales for example, it’s a fight over four seats but really just a fight for one. The three top parties will get a seat each, then they all battle for the remaining one. UKIP in the past, probably Brexit party this time win this 4th seat because of vote splitting/fragmentation. @TomSpilsbury @VortiGan_ @paulshields That aa massive myth. The EU parliamentary elections are as prone to vote fragmenting as FPTP. Some of the regions only have 4 seats up for grabs. All the smaller parties will lose out and their votes will be wasted. @ConLewisFarley @benjamin_cook @Apollostowel I think Benjamin Cook didn’t actually mean this to turn out how it has. He obviously had no idea about anyone’s sickness. However, he can really be a thoroughly nasty guy. He used the C word against a friend and made false accusations. Yet asks you to temper your language! @MaddoxProTweets It's unfortunate that it hasn't. #dwsr was a hell of a lot worse during the Capaldi era though. Genuinely hated it. 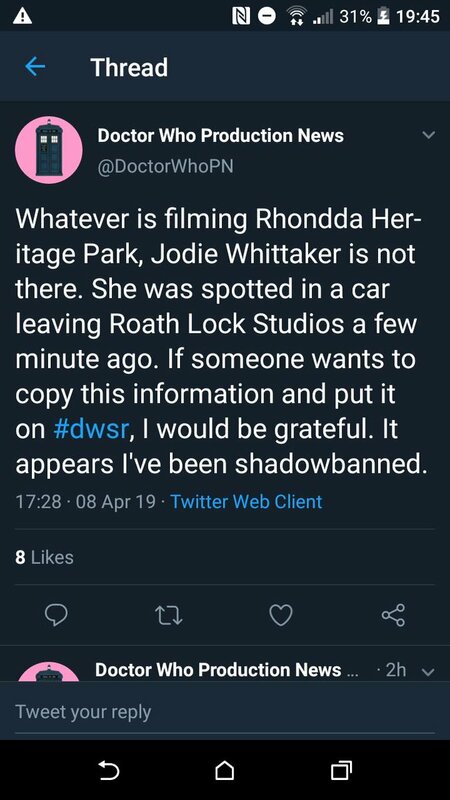 @TheWatcherIsBae And here I was thinking that #dwsr had finally been slain by Chibnall. "@DoctorWhoPN: I'm guessing they were/are filming Doctor Who somewhere at or near Auditorio de Tenerife #dwsr"Awesome! @robgreen299 @simon_watkins @Worker270591 @Amelia_Womack Translation: I can’t argue the facts so I’ll scuttle off. It was you who started the unpleasantness.